Born: 1865, Bannockburn, Scotlant, United Kingdom. Died: 1 October 1949, Durban, South Africa. William Buchanan served an engineering apprenticeship and qualified as Bachelor of Science (BSc) at the University of Glasgow in 1892. At some time he also studied at the Royal College of Science in London and was made an associate of that institution (ARSM). He became a member of the (British) Institution of Electrical Engineers and held various appointments in the United Kingdom: Electrician with the London Electric Supply Company at Deptford, engineer with the Fowler-Waring Cables Company at North-Woolwitch, and electrical engineer with the Electric Construction Company at Bushbury Works in Wolverhampton. 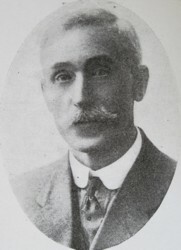 Buchanan came to South Africa in 1911 to take up an appointment as professor of electrotechnics at the South African School of Mines and Technology (from 1922 the University of the Witwatersrand) in Johannesburg. Two years later he established himself in practice as a consulting electrical engineer, in which he continued until his retirement in 1941. He became a member of the South African Institute of Electrical Engineers in 1911, served for some time as honorary treasurer and vice-president, became its president for 1916-1917, and was elected an honorary member in 1942. The papers he contributed to the institute's Transactions included the following: 'Electrification of railways' (1913), 'Life and work of Lord Kelvin' (1916, Presidential address), 'A short description of the circle diagram' (1917), and 'James Clerk Maxwell (Centenary)' (1931). During World War I Buchanan was mainly responsible for compiling a Report on electro-chemical industries, published by the Resources Committee of the South African Institute of Electrical Engineers. In 1915 he and Dr Bernard Price* represented the institute at a Munitions Conference organised by the Minister of Defence. The next year they represented the institute on a committee that investigated the local manufacture of shoes and dies. This committee recommended to the Chamber of Mines that an electric smelting plant be erected on the Witwatersrand. Buchanan was chiefly responsible for the design of this plant and remained involved in its operation by the Witwatersrand Co-operative Smelting works until 1925. The project was described in a paper by him and Professor G.H. Stanley*, 'The first electric steel-making furnace in South Africa' (Transactions of the South African Institute of Electrical Engineers, 1917, Vol. 8(9), p. 221), a paper for which they received the institute's Gold Medal award. In 1916 Buchanan also became a member of the Industrial Research Committee which was established that year, and served on its executive committee. In 1919 he represented the South African Institute of Electrical Engineers on the Joint Committee of Technical Societies, and in 1929 was president of the Associated Scientific and Technical Societies of South Africa. He acted as consultant to several mining houses and municipalities. After his retirement he settled in Durban. Obituary: Professor W. Buchanan. Transactions of the South African Institute of Electrical Engineers, 1949, Vol. 40, p. 247. University of the Cape of Good Hope. Calendar, 1912-1913 and 1913-1914, Colleges.